Lately it feels like I just don’t know how to write anymore. I know I should just sit down at my desk and begin, but there’s always the dishes and my unruly closet that seems to just spit things out of its depths onto all of the nearest surfaces, and oh, now would be such a good time for that face-mask (it has tiny exfoliating pearls!). Ok, now some cream, and while we’re at it, let’s put some on my legs- those things haven’t seen daylight in a while. Go downstairs, pour glass of water, sit at desk. Wait, coffee. Position computer, open word document. Decide you have to check Facebook for just a second. Oh, a TED playlist on creativity! How perfect!! Maybe that will help! Watch one, no, two videos. Stretch. Decide you need to eat something. An avocado, split in half, yielding softly, its cavities piled high with tuna? A small salad of cherry tomatoes and cucumbers fresh from the market, topped with some of that sheep’s milk feta that’s so smooth and creamy they must be lying that it’s five percent? That stuff is good. Yeah, that’s what I’ll have. Go into the kitchen, make salad. Eye the jar of coconut oil sitting on the shelf above your counter. Decide that now would be the perfect time to slather some onto your cutting boards, your wooden spoons, and hey, now that you’re taking such close inventory- your arms are not in much better shape than your legs. Pile it on. Sit on couch with salad (it’s just sad to eat at your desk); this way, you can think! Brainstorm! Then, you’ll write. Promise. Pick up your iPad (first mistake) check feedly (second mistake) get lost in that glorious black hole that is the world of food blogs (third mistake). Decide you need a cracker. Pile it high with a soft, creamy, rich goat cheese that is most definitely not five percent. (Coffee? Or coffee liqueur? Because you just bought a bottle of Kahlua for a recipe that called for 5 teaspoons, and that means a lot of leftovers staring you down). Opt for coffee. Because: need to write. There’s that blog I have, the people waiting, it’s what I’m supposed to be doing, part of my identity. At the critical junction of the hallway, where right is into your study and left is onto your sofa- you make a left. You begin to hate yourself. The voices kick in: Come on, write a little. Then louder, shriller: Why can’t you just write a little, dammit?! WHAT THE HELL IS WRONG WITH YOU. Decide that now, really, would be the best time for a nap. Decide you’re not going to berate yourself, no. Instead open your mouth, wide, and shovel in all the chips you can find. Then, on your way back, make a right- not a left- and sit down. As Laura notes, these bars are more soft/chewy than crispy/crunchy. I loved them! Preheat the oven to 350F/180C. Line an 8X11 or 8X12 pan with parchment paper (with overhang on the sides). Set aside. In a blender or food processor, combine the bananas, almond butter, brown rice syrup, maple syrup, coconut oil, cinnamon and sea salt. Pulse or blend until homogenous and creamy. Set aside. If you don’t have a blender/food processor: Mash up the bananas with a fork and then whisk in the other wet ingredients. 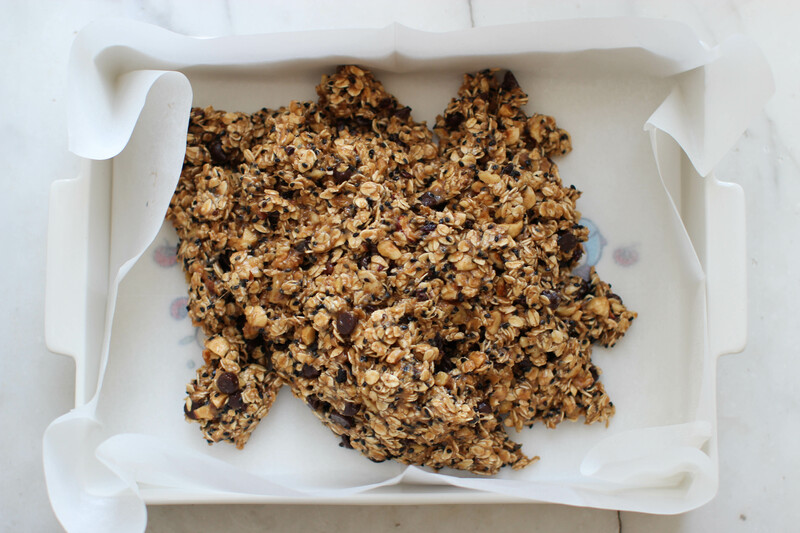 In a large bowl, combine the oats, chopped nuts, seeds, chocolate chips etc. Stir to mix. Add the banana mixture and stir until thoroughly combined. Scrape the mix into the prepared pan. Smooth the mix out, pressing down with a flat surface (measuring cup, spatula) until it fills the pan evenly. Bake for 40 minutes or until golden on the top and around the edges. Remove from the oven and allow to cool thoroughly on a rack. Once completely cool, hold the overhanging parchment and gently lift the bars out of the pan and onto a cutting board. Cut the slab right down the middle lengthwise; then cut both halves into 8 bars each. In a double boiler or a non-reactive pan set over a saucepan of barely simmering water, combine the chocolate drizzle ingredients. Stir constantly with a spatula until chocolate is melted and a sauce forms. Drizzle over the cut granola bars (I filled a plastic ziploc bag with the sauce, then snipped off an end, and used that to drizzle). Refrigerate the bars until the chocolate hardens- about 30 minutes. Keep in an airtight container for about a week. 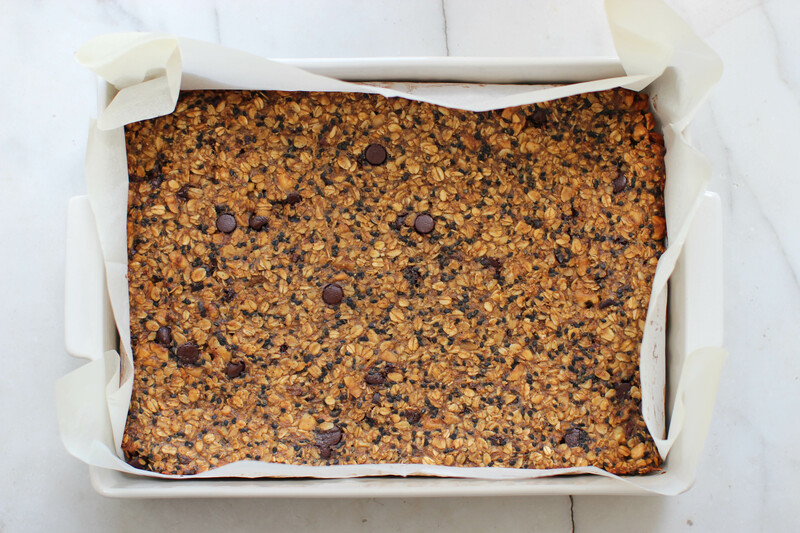 these bars are wonderfully healthy! boy, can i relate to this post! the house always needs cleaning when it’s time to write. seriously!!!! and to think cleaning is one of my least favorite things! interesting that just when i should be sitting down to write, it suddenly becomes FASCINATING and totally urgent. cool! hope you like them! I related so much to your post, I got distracted and am finally replying now. I can’t even enumerate all the times my priorities have changed in any given day because they keep changing. At work I have lists of priorities and all or most get done. At home, that’s another story. Baking somehow centers me and is a good place to start. 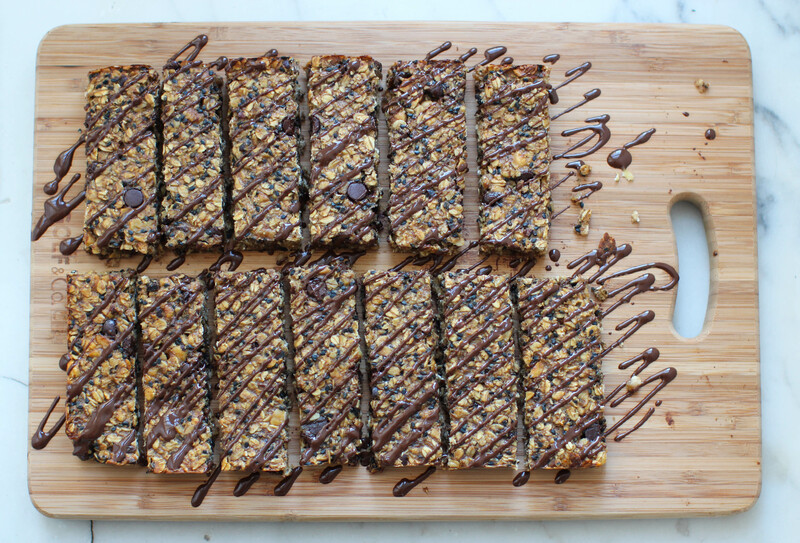 Your granola bars look scrumptious! These look amazing!!!! I am making these as an afterschool snack!!!! !